The Albany Bulb is the former dump of the city of Albany, CA. It was built on landfill. 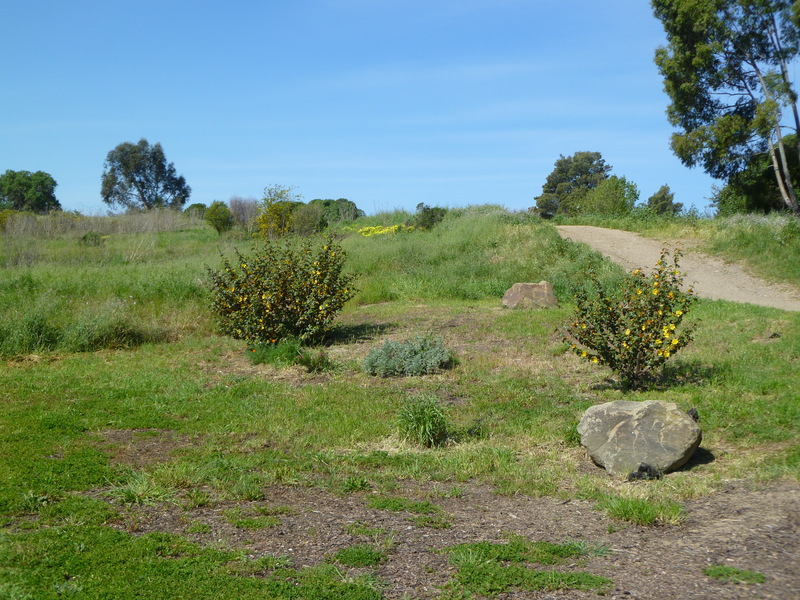 The East Bay Regional Park District (EBRPD) recently announced its intention to “restore” it as a native plant garden, though it admits that the word “restore” is a misnomer for a place that was never populated by native plants. Presently, the Bulb contains an eclectic collection of art built from the junk that remains from the dump. Non-native plants and trees thrive there with no care. Please visit our post about the Albany Bulb for photos of this colorful and unique recreational and artistic resource. 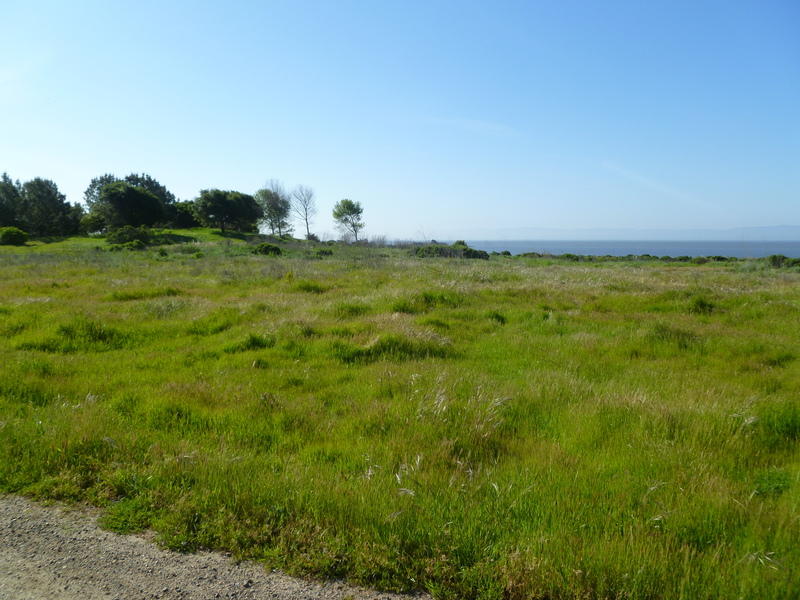 We recently had the opportunity to express our opinion of plans for the Albany Bulb in a conversation with the Assistant General Manager of Planning/Stewardship & Development of EBRPD. 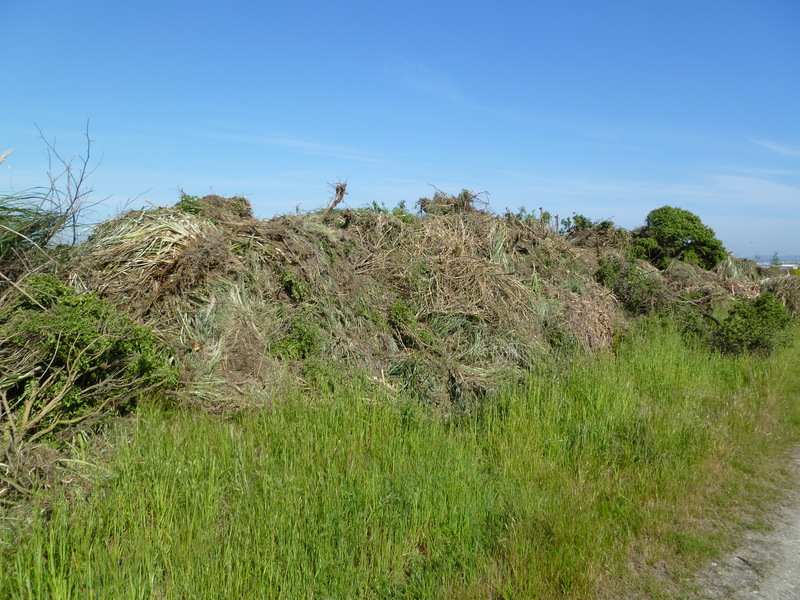 We told the manager that it is pointless to destroy the Albany Bulb because it is an artificial place in which native plants are not more native than what grows there now without any care. It is a heavily used place that does not require any “improvements.” It is therefore a waste of money to destroy something that everyone loves just as it is. The manager told us that we would also love the native plant garden once it is done. He said that visitors often object to plans for changes in their park, but that when the project is done, they are always happy with it. He urged us to visit Oyster Bay, a former dump for the city of San Leandro, also built on landfill. He said it is now a beautiful native plant garden that everyone is delighted to visit. And so, of course, we had to see this transformation because we want to know what is in store for the Albany Bulb. This is what we found at Oyster Bay. We found hundreds of stumps of trees that have been destroyed. Many of the trees are now resprouting. 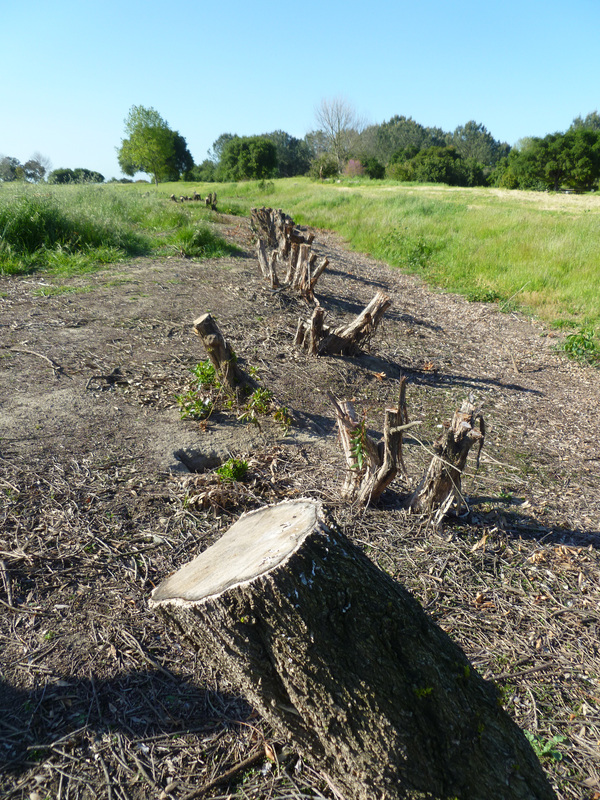 We wondered if the resprouts would be poisoned to prevent the trees from regenerating. If not, we wondered how long it would take for the trees to return. The ground around the tree stumps was a labyrinth of the holes made by animals that had lived in them in the past. The animals have moved on, perhaps to the cover provided by trees nearby. We found a green sea of non-native grass. We found a small patch of native plants at the entrance of the park and a sign informing us that this scene of destruction is a “park improvement” project. We also spoke to one of the few visitors we encountered on this beautiful spring Saturday. We asked if they had been coming to the park for a long time. They said that had. We asked how they felt about the changes in the park, without giving them any clues as to our own assessment. They readily volunteered that they didn’t understand why the trees were destroyed. Once again, we are reminded that beauty is in the eye of the beholder. Assuming that the park manager with whom we spoke about Oyster Bay has actually seen this park, and that he sincerely believes that it is a lovely native plant garden, we must beg to differ. Although it is a beautiful park, it has not been improved by the needless destruction of trees and vegetation. The beauty of this park derives from its diverse collection of predominantly non-native plants and trees. We hope that it will not be further damaged by an agenda that is devoted to native plants, not to the enjoyment of park visitors. 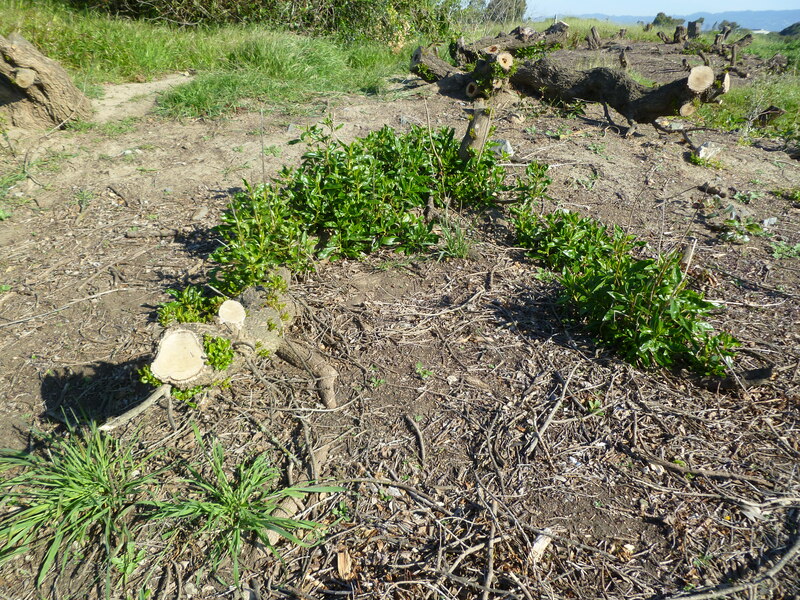 Likewise, the Albany Bulb is unlikely to be improved by destroying plants, trees, and art that is all doing just fine without any intervention by the East Bay Regional Park District. We urge the Park District to LET IT BE! The point isn’t, “when the project is done, they are always happy with it”. That means people stop complaining. 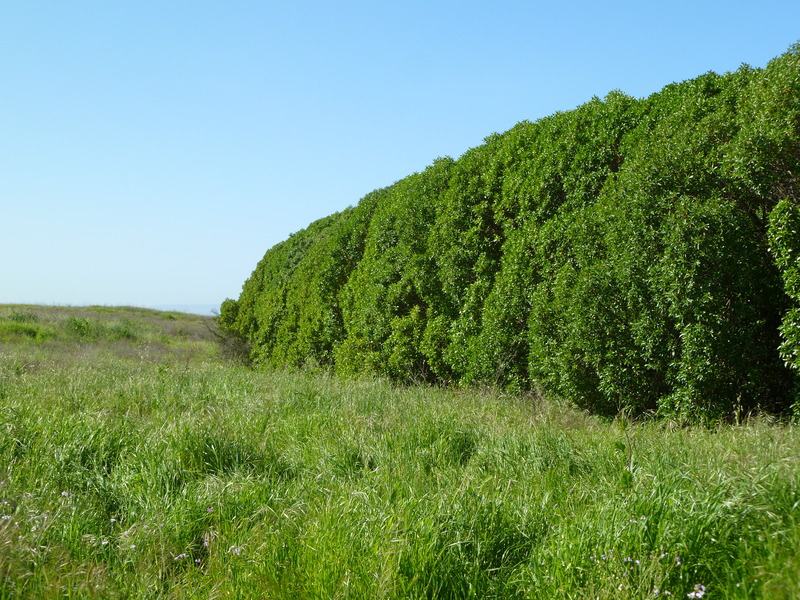 It’s all about the philosophical differences between removing an existing healthy Natural environment (look up the meaning) and substituting a human crafted Native Plant Only environment. Wherever we go, we create change. Our history shows a lineage of mistakes made in the pursuit of profit. Many ask, “How long will it take for us to learn to live in harmony with our environment. There is no place on the planet that our hand has not touched. You can file that under the catch words, “native plant restoration”, “enhancing public safety”, and best of all “natural enhancement”. Any one else see this as an oxymoron? Good money can be made today, as an environmental restoration contractor. Oh, yeah, and many of these PW projects are funded from our property taxes. Which happen to be due today. What a coincidence! As an amateur bird photographer, I once enjoyed Oyster Bay. In the past, It was home to an abundance of songbirds raptors, and animal life. All that was around 8 years ago before all the “improvements” and other changes. 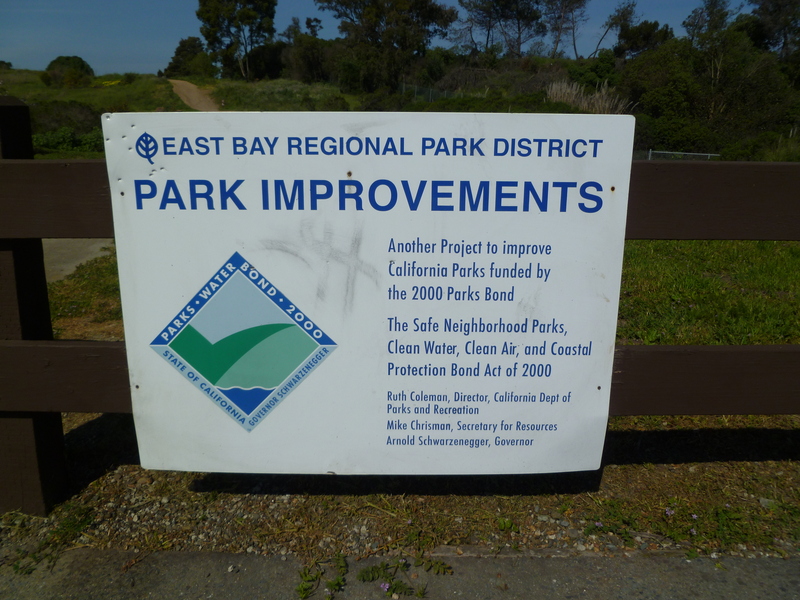 In a recent spin piece from EBRPD about the park renovation, I was startled to read- “home to an astonishing variety of wildlife”. What? Vast areas of the park have been scraped clean of trees and plants leaving nothing but barren clay. Even your pictures above would now find nothing growing there. The cultured lawn they recently put in used to be an area of ground squirrel burrows and grasses to feed on which in turn provided prey for the raptors. White-tailed Kites, Cooper’s Hawks, Red-tailed Hawks, and Red-shouldered Hawks were regular hunters of the area. WTK’s once nested in the tall perimeter trees and Cooper’s perched in trees which are now gone. In the late afternoon, dozens of Barn Swallows and swifts would skim the grassy area for insects. Now the bright green lawn (with regular doses of herbicides and fertilizers) provides nothing. The on-leash areas are ignored by a significant percentage of dog-owners. Some even walk them off-leash through the very small nature preserve area ignoring the posted “No Dogs Allowed” signs at the entrance. One sad satisfaction was to see an off-leash dog kill a skunk in the nature preserve and get completely doused with spray to the dismay of its owner. The park is about 24 acres. If there is ever to be a habitat for wildlife there again the dog problem must be addressed. It would be best if a section of many acres be fenced as a dog run. 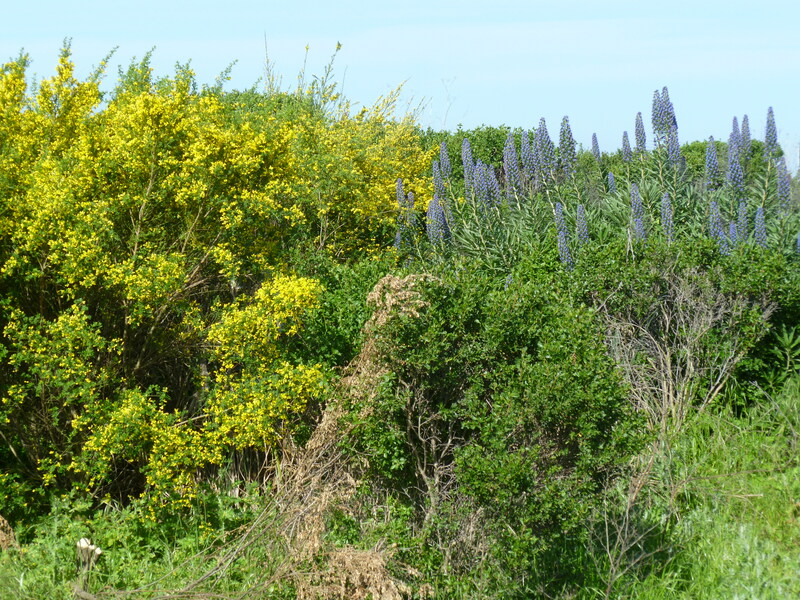 As far as creating a native-plant paradise, I am 70 years old and do not expect to see that in my remaining lifetime. I rarely visit the park anymore. In every sense of the phrase, it has gone to the dogs. Webmaster: Thank you for your visit and for your interesting observations. I have dogs which I walk mostly on-leash and only in legal off-leash areas. I don’t condone the behavior of irresponsible dog owners. However, I invite you to consider that if the habitat of wildlife had not been destroyed at Oyster Bay, wildlife would have access to the cover they need to be inaccessible to the dogs. So, as we often do on Million Trees, we ask that you consider the cause of the disappearance of wildlife at Oyster Bay. For example, if there were still a dense forest, as there once was, birds would be able to take refuge in the trees and rabbits and other ground dwellers would be able to disappear into their underground dens. Also, aside from the presence of dogs, without trees and other dense vegetation, animals are unlikely to find what they need to eat or safe places to nest.